A scroll saw can be incredibly useful If you have a need to make precise and intricate cuts on wood and other materials. However, with so many types and brands available, choosing a scroll saw can become a daunting task. Today, we'll look at a few primary considerations that can help you make the right choice that is most suitable for your particular needs. 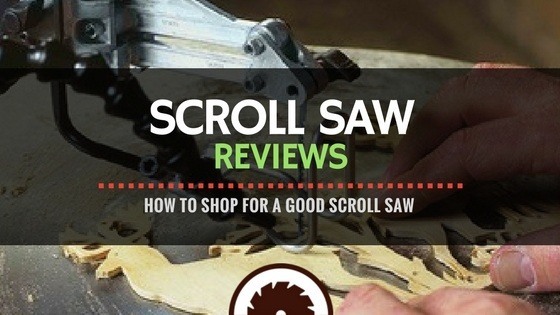 We'll also dive into a few scroll saw reviews and helpful tips to help you start shopping! A scroll saw is an electrically powered saw that has the ability to cut and make cut-outs in wood and other materials such as metal or plastic. It cuts like other saws, such as a band saws or jigsaws, but it is much more accurate, faster and sharper to use. To choose the right scroll saw for your needs, you first need to determine the type of work you will be doing. If you only require simple cut-outs, a lower-quality saw might suffice as you do not require a scroll saw with many features. However, if you will be doing some intricate woodwork and cuts that require precision cutting, then you may need a higher-quality saw with many of the bells and whistles. If your woodwork falls somewhere in the middle and is used for more craft-inclined projects, then a mid-range model would probably be most ideal. There are many types of saws that can cut scrolls or make non-linear cuts such as scroll saws, band saws, and jigsaws. The major advantage of a scroll saw versus a band saw is that a scroll saw makes much more intricate cuts, including 90-degree cuts; whereas a band saw is more appropriate for making gentle curves. A jigsaw can also make intricate cuts, however, a scroll saw is stationary, whereas the jigsaw is handheld. There are several advantages of a scroll saw vs a jigsaw, as the scroll saw can do 3D fractal and pierce cuts which a jigsaw cannot. The scroll saw also has varying speed controls due to its powerful motor and making the scroll saw nearly vibration-free and relatively quiet. The arm of the scroll saw is designed to avoid under or over or cutting as the blade will stay perpendicular to the cutting surface. The scroll saw has several advantages. A major advantage of the scroll saw is it its ability to cut intricate patterns with small radius curves. It also uses very thin blades and can be small enough to thread through a 1/32″ hole. It produces precise and clean cuts which require little or no sanding. Although there are many types of scroll saws to choose from, there are several features for scroll saws to consider while comparing each for purchase. The most common features to consider for the average at-home woodworker are the speed and capacity of the scroll saw. Metal and plastic require slower cutting speeds than wood, so you should choose a saw equipped for your most common usage. Older scroll saws may only offer a few speeds, while newer, higher-end models offer variable speeds making your saw more versatile. Saw size, or capacity, is based on throat depth, which is the distance between the blade and the rear frame. Most scroll saws with a 16- or 18-inch capacity is suitable for most home users. Professional use might require a larger capacity such as a 20-inch saw size. Although there are several features, look for saws that have a blade-tensioning system that will provide for quick blade changes, and tilting tables for better cutting angles. There are also other features to consider when comparing different scroll saws. For instance, there are several blade related features such as quick-release tension levers and tool-free blade changes. The type of table can also be an important feature to consider as it can vary in the type of material it’s made of. Unlike the aluminum of other types of tables, cast-iron tables are extremely durable and allows your material to slide smoothly over the table. You can also choose a table that tilts in both directions, instead of just to the left. The table on most scroll saws tilts up to 45 degrees to the left but some tables can tilt in both directions, so you will not have to flip your work material. Since saw dust can be a serious health hazard and a pain to clean up, a scroll saw equipped with a dust port allows you to connect your tool to a dust collection system directly to your saw, so you can remove sawdust before it has a chance to enter the air. The DeWalt 20-Inch Variable-Speed Scroll Saw is designed to help you create accurate, detailed workpieces with ease. It is user-friendly, has a cast-iron table, and has a flexible dust blower to keep your work area clean. The DeWalt DW788 scroll saw has a double parallel-link arm design that helps reduce vibrations. The arm pivots from the back of the saw to the front, shortening the distance that the arm needs to move resulting in a quieter and smoother saw operation. You can control the scroll saw's electronic variable-speed control ranging from 400 to 1,750 strokes per minute. This saw also has tool-free blade changes and an adjustable table. The DeWalt scroll saw weighs 56 pounds giving it a heavy-duty feel, yet it is portable enough to move around the shop easily. The table also bevels 45 degrees to the left and 45 degrees to the right so you do not have to flip your working material. This is a great beginner scroll saw that comes with electronically manipulated speeds. The table tilts to the left and right and that sets this machine apart from its competitors. This flexibility is for beginners getting their feel for a scroll saw. This particular saw also works well with plastic. The blades are designed to be really sharp and can handle a range of materials. The blades may also be changed quickly with the quick-change clamps that are provided with the saw. The table is positioned in a square format in relation to the blade. There is also nearly no vibration as the saw is virtually silent. Black & Decker BT4000 comes with several blades, a table insert for handling fine work, rubber mounting feet making it feel very sturdy, and a book of scroll saw tips and patterns great for beginners and the average home woodworker. Every adjustment that you'll need to make on this saw is done with a knob, lever or thumbscrew making it easy to make tool-free adjustments. It does seem to vibrate a little more compared to similar models at higher speeds. It also has pull/push On/Off switches that make it very user friendly. It also has a very sturdy hold down/guard that is easy to adjust for beveled cuts. Blade tensioning is quickly adjusted and set with a cam-lock lever at the rear of the tool, and there's a convenient blade tray on the top of the arm housing. The Craftsman is a great mid-ranged saw with a suitable balance between features and price. The Craftsman uses a parallel-arm system, which uses fewer parts and is designed to reduce the impact of vibration. It also has a cast iron table which itself makes the saw quieter and sturdier. Weighting just at 38 lbs., the Craftsman feels heavy duty but also is portable enough to move around your shop easily. The Craftsman offers 45 degrees of left-tilt like most other scroll saws and can cut through 1 inch of material. However, the saw doesn’t offer right-tilt functionality, so you may have to flip your material if you are doing bevel cuts. It does offer variable speed controls, so you can use it for a variety of different materials. Overall, this is a great scroll saw for mid-range needs and woodworkers. It is also more affordable compared to some of the higher-end saws. This saw is equipped with a quick-release tensioning blade system that speeds the process of setting up internal cuts because you can just flip the lever to slacken the blade. It also has on-board blade and tool storage and there is side-mounted vacuum dust port below the table. This is a great scroll saw for mid-level and craft usage. Overall, any of these saws are capable of your basic woodwork and cutting needs. However, if your budget allows for it, the DeWalt 20-Inch Variable-Speed Scroll Saw is the clear winner and an excellent addition to your tool arsenal. This scroll saw is durable, and offers all of the features you need and want including tool-less blade changing, variable speeds and a tilting table for beveled angles. It is the most expensive out of all the scroll saws reviewed so you should only make this investment if you plan on getting a lot of use out of your scroll saw.